Over 2,500 computer ports are now available to Sam Houston State University students in campus residence halls, thanks to a grant from the Telecommunications Infrastructure Fund Board. The TIFB, established in 1995 by the Texas legislature, receives approximately $150 million per year in revenues from telecommunications assessments to disburse over a ten-year period. The SHSU proposal for the $790,187 grant centered on increasing student access to the local campus network and the Internet. "Specifically, the proposal included increasing the pool of modems available for dial-in access, as well as the wiring of the residence halls for Ethernet," said Nina Cooper, computer systems coordinator. Ethernet is the computer communications network used by the university. Installing Ethernet connections in the residence halls presented unique challenges because many of the buildings are historic, older buildings not originally designed for high-speed data connection wiring. "Wiring closets were eked out of existing space, or in some cases, new rooms were constructed," said Cooper. The university's physical plant department, in conjunction with outside contractors, pulled the cable within the buildings. The contractors provided wiring documentation giving line locations and cable test results. As a result of the wiring work, there are now at least two Ethernet ports in each room. The connections for the residence halls on the north side of campus all run to a central location in the George J. Beto Criminal Justice Center. Connections from the south side of campus converge in the Lee Drain Building. In both buildings, the residence hall connections pass through a system designed to prevent unauthorized access called a "firewall," before coming onto the campus network. Two new switches were also installed in the Criminal Justice Center and the Lee Drain Building. Ethernet switches were also upgraded or replaced with new switches to create a higher speed data transfer backbone for the local campus network. In order to increase access to the campus computer through dial-up, a Cisco AS5300 Remote Access Server was installed in the university's Telco Center to provide 200 new modem ports. Additionally, the Cisco Ethernet switch that the modems are connected to was upgraded. 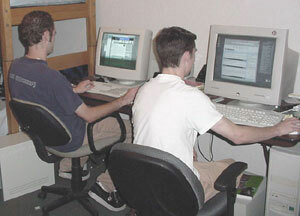 The TIFB project was competed in August 2000 with a total of 2528 ports available to students in residence halls. To date, over 1000 students have requested and been granted an active port. Grants from the TIFB are awarded to four-year colleges and universities to enhance existing Internet connections and to purchase equipment for video conferencing. Grants for up to $1.5 million will fund workstations, networking hardware, ISP costs, videoconferencing equipment and other related telecommunications costs.